3.25 p.m. R7 3 Ruby Armani (5 m Makfi – Trujillo, by Saint Ballado) – Cameron Lammas; is having her third consecutive start here, in the $50,000 Rangitikei Gold Cup (Listed, 1550m), having finished second in the Flying Handicap (Listed, 1400m) and following up with a very good win in the ITM Anzac (Listed, 1550m) on 25 April. She has trained on, worked well on rain-affected going Tuesday morning and although up 3kgs to carry 56kgs has the form to be respected. Fixed odds: $4.20 & $1.60. 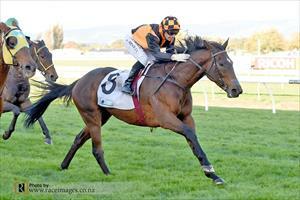 3.25 p.m. R7 9 Saffron Lady (5 m Iffraaj – Colourfast, by Pentire) – Darryl Bradley; sustained a big finish to win the Rating 75 1600 metres on Heavy10 at Pukekohe, 21 April, and now contests her first stakes race in the $50,000 Rangitikei Gold Cup (Listed, 1550m). She too has trained on, brings winning form, and can prove competitive if appreciative of the course at her first attempt. Fixed odds: $14.00 & $3.60. 4.34 p.m. R9 10 Avec Moi (4 m Pour Moi – Fuji Belle, by Fuji Kiseki) – Taiki Yanagida (a4); produced a solid effort after being caught wide on 26 April in the Rating 65 1600 metres at Tauranga, and contests the $22,500 Rating 65 1600 metres. Second here over 1400 metres on Slow7 last June, she has weight relief to 53.5kgs and ensured an economical trip from barrier two in a strong field. Fixed odds: Fixed odds: $34.00 & $9.00.